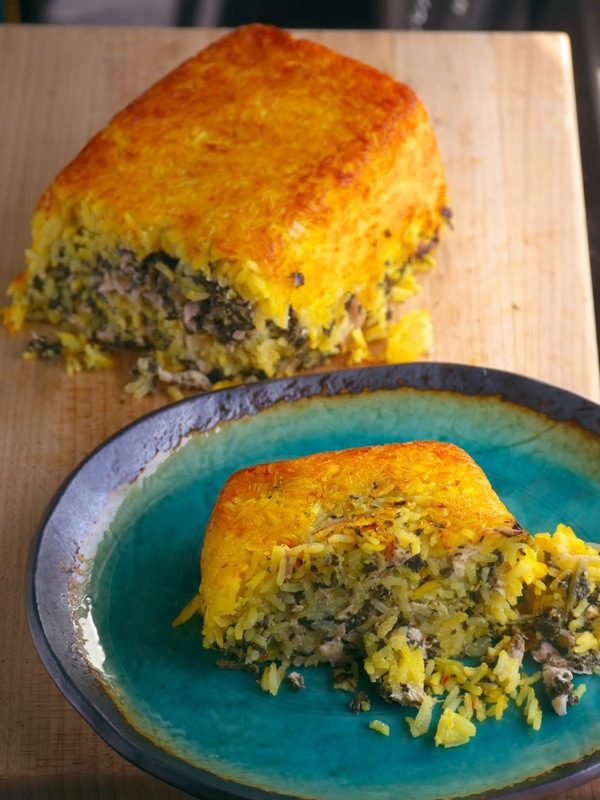 Tah-chin is Persian savory rice cake, made with a mixture of rice and yogurt custard. Being an all time Persian favorite, Spinach Tah-chin is traditionally made by stuffing cooked chicken and spinach in between the rice layers. Inspired by French cooking techniques, I give a modern twist to this classic dish. Please note that this version, containing raw chicken which cooks along side the rice, is not the traditional way of cooking this dish. De-bone the thighs and reserve the skin. Finely chop the onion. Parboil and drain the rice according to the these instruction. Saute the onion in butter. 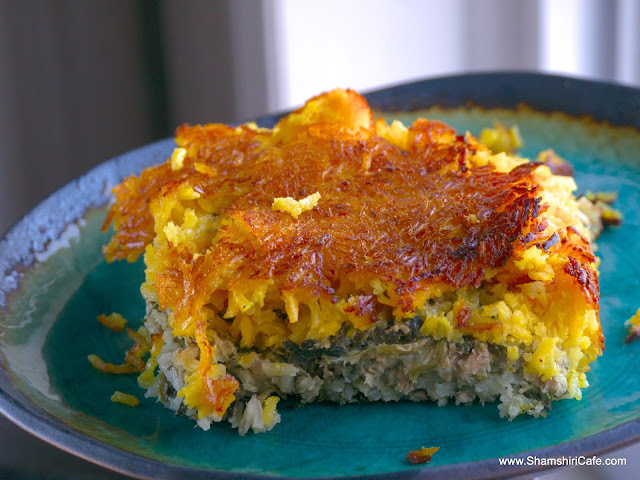 When translucent, add the spinach and increase the heat to high. Wilt and season with salt, pepper and lime juice. set a side to cool. Season the de-boned meat (which should weigh around 1 Pound~ 450 gr) with salt and pepper and process to a coarsely. Make the custard by combing all the ingredients. When adding the parboiled rice to the custard, if the mixture is thick and hard to stir, add a dash of oil or melted butter. In a third bowl, mix half of the rice mixture with half of the meat mixture. Preheat the oven on 400 F(~205 C). Rub a 20x30 cm pan with oil or cold butter and spread out the rice layer. Then, a layer of the meat. The third layer would be the meat/rice mixture. And finish it up with whatever is left. To get crispy skin, I covered the rice with the skins and seasoned them with plenty of salt. Make sure the skin is completely dry. This is an optional step. If chose not to use, cover the pan with aluminum foil. Bake on the middle rack for 30 to 40 minutes or until the skin is golden brown and the rice is crispy. If using aluminum, remove it after 20 minutes. Take out of the pan, cut and serve. This is the first time i see Ta-chin with spinach???!!! It is actually very popular.